Go to our download page. Click the Download for Windows button. Your download will start and you'll be directed to our Download Started page with some helpful content to get started with Ghost Browser. Click the Ghost Browser .exe file in your computer's downloads folder to begin the installation. When the Ghost installer window appears, click Install. After installation, when Ghost Browser launches, the Ghost Browser’s Terms of Service page will open. After reading, select the checkbox and click Accept. Next, you'll see a page on our website with tutorial videos to help you get started with the basics of using Ghost Browser. We recommend that you watch these videos, you'll be a Ghost Browser pro in just a few minutes! Click Download for macOS. 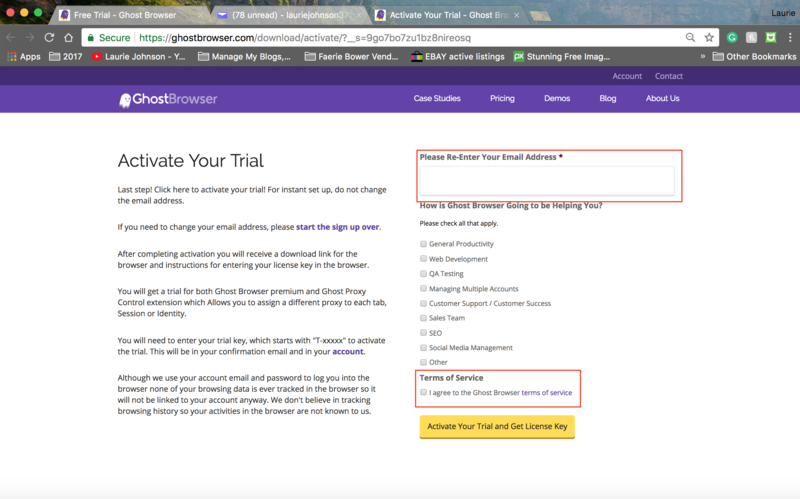 Your download will start and you'll be directed to our Download Started page with some helpful content to get started with Ghost Browser. After the file downloads, click the Ghost Browser .dmg installer file in your computer's downloads folder to start the installation. Drag the Ghost Browser icon into your Applications folder. Double-click the Applications folder to open it. In the Applications folder, double-click the Ghost Browser icon. The standard Mac download warning message may appear. Click Open to launch Ghost Browser. After installation, when Ghost Browser launches, the Ghost Browser Terms of Service page will open. After reading, select the checkbox and click Accept.